Detained on Thursday, the founder of WikiLeaks Julian Assange was placed in a maximum-security prison near London. The institution Belmarsh is known for holding particularly dangerous terrorists there, along with ordinary criminals. British law enforcement agencies have to decide where to extradite the detainee: in Sweden or the United States. His life may depend on it, because he became a voluntary prisoner of the Ecuadorian embassy for fear of receiving the death sentence in America. Margarita Simonyan, editor-in-chief of the Russia Today channel, told MK how she met Assange and if he could hope for a fair trial. On Saturday, April 13, a group of British parliamentarians sent a letter to the government demanding the extradition of Assange to Sweden. In 2010, a case of sexual violence was filed against him in the Scandinavian country. In 2017, it was discontinued, but the founder of WikiLeaks did not leave the embassy of Ecuador. 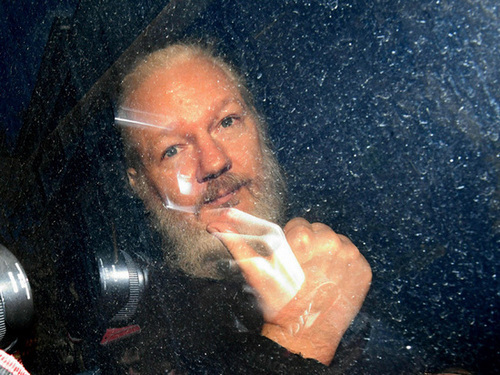 A recent arrest occurred in connection with the request for the extradition of Assange from the United States, as well as for violation of the conditions for release on bail. A request for extradition from Sweden has not yet been received, but the local prosecutor’s office has already received a request to reopen the case against Assange. In the meantime, the London judges think who will issue an Internet dissident to him, he is being held in the Belmarsh prison. This was told to Bloomberg by his friend Von Smith. This institution was nicknamed “British Guantanamo”: among its especially dangerous “guests” is the “right hand” of Osama bin Laden Abu Qatad and suicide bombers who tried to arrange explosions in public transport in London. Worried about the fate of Assange and in Russia. In 2012, he led a personal program called “The World Tomorrow” (The World Tomorrow) on the Russian TV channel Russia Today. Its editor-in-chief, Margarita Simonyan, told MK how the idea of ​​transmission came about and whether she could return to the screens. – Do you think Assange can hope for a fair trial? – Of course, we hope for the best, but there can be no talk of justice here. Assange can not forgive that he opened the world his eyes to the monstrous crimes. He told about the torture at Guantanamo, for which America is justified so far, published a huge array of American diplomatic dispatches that revealed corruption throughout the world, and made public the record of the execution of civilians and journalists in Iraq, which were covered by the US military. Not to mention political stories – the merged correspondence of the candidate for US Vice President Sarah Palin in 2008 and the letters of the Democratic Party in 2016. Assange himself foresaw what would happen to him. Many years ago, he said that the new president of Ecuador would extradite him, and Britain would extradite him to the United States, where he would face a mad time in prison, if not the death penalty. – How did the idea of ​​personal transfer Assange on RT The World Tomorrow? How do you assess what finally happened, and how was the joint work with Assange on this project? – I met Assange eight years ago, when he was still under house arrest. He then lived in a house with a friend, in a village near London. We went for a walk in the woods – because he was afraid of wiretapping – and we talked a lot about how the world works, who it controls, how we are followed. The idea of ​​conducting an author’s show on RT, if I remember correctly, belonged to Assange himself. Our guys flew to him in London, thought about the format, discussed the details. The show was brilliant, it was even recognized by the jury of the New York Festivals – a television contest that is being held in America. – Are you ready to resume the transfer if Assange is free? – If Assange is free, we will be happy. Of course, we will resume the program if he has such an opportunity. – You know Julian for many years. Do you think that what the staff of the Ecuadorian embassy say about him (he allegedly behaved himself inappropriately) may be true? “Listen, it is indecent and embarrassing to spread these anonymous nasty things about a person who changed the world for the better, opening human eyes to monstrous crimes, and now for this, most likely, will live in prison.